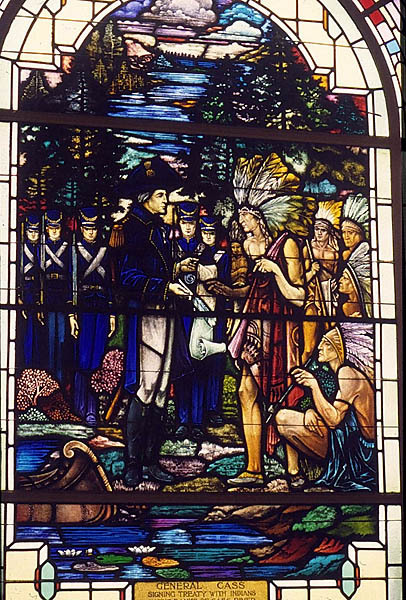 This large window at the Tuscola County Courthouse depicts General Lewis Cass signing the Treaty of Saginaw with the Chippewa people in 1819 on the banks of the Cass River. General Cass and American soldiers stand on the left, Chief Joshua Maish-kee-awshe and his Chippewa braves on the right. The treaty transferred tribal lands to the United States government in return for payments, annuities and services. The agreement involved the Saginaw River valley and much of the central and northeastern portion of Michigan's Lower Peninsula. Cass was military and civil governor of the Michigan Territory from 1813 to 1831. He later served as a U.S. Secretary of War, Senator, 1848 presidential candidate, and Secretary of State. Designed by Detroit architect William H. Kuni and built in 1932-33 by Caro native Cecil M. Kelly of Flint, the Tuscola County Courthouse is a registered Michigan Historic Site. The window was designed by A. Kay Herbert of Detroit and made by the Detroit Stained Glass Works, which was established at Detroit in 1861 by Charles Friederichs and Peter Staffin under the name of Friederichs and Staffin. Its name was changed to the Detroit Stained Glass Works in 1914. Operating for more than 100 years until its closing in 1970, the firm provided countless windows for churches, homes, steamboats and railroad cars in Michigan and other states. Tuscola County Courthouse of Caro was registered in the Michigan Stained Glass Census by Marilyn Margaret Hausler of Caro. Text by Betty MacDowell, Michigan Stained Glass Census, November , 1997.